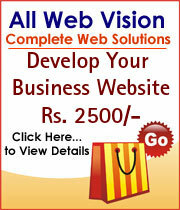 ALL WEB VISION Provides all solution under one roof operates like Domain Name Registration, managed hosting solutions that combine best-in-breed technology, a 100% uptime guarantee, and amazing customer service, Seo and many more.With the experience of 16 years in Web Development and more then +1000 websites designed, We have been offering a fast and reliable platform since 1996 to establish and maintain a professional web presence — all at an affordable price. Address: Office No.11, 1st Floor, Goverdhan Tower, 150 Feet Road, Near Fly Over Bridge, Above Tata Indicom Gallery, Bhayandar (West) Mumbai - 401101. India.